One of the enduring traditions of American Jewry is “Chinese food for Christmas.” More specifically, Chinese food—and a movie. Reform Jews get to choose whether to see the movie first or conform to the requirement of feeding pre-picture. And so, last Christmas, three generations of my family went to see Lincoln (excellent, by the way) and then to China Max for our feast. I have no problem with China Max most of the time; its dim sum is excellent. But the menu is unadventurous, the ambiance lacks and the kitchen seems to go into brain freeze when busy. That’s how it was last Christmas night. The lines were five deep and four wide out the door, service slow, execution ordinary and the menu Plain Jane. As we walked out the door afterward, pushing through a crowd of more Jews than Asians, I looked across the parking lot and saw another restaurant with longer lines and a far higher percentage of Asians. I had to see what it was. Soon, we did. We started our meal with selections from an excellent cold-appetizer bar. Highlights included a seaweed dish subtly flavored with soy and a beef dish that opened the palette with Sichuan peppercorns. It was a preview of coming attractions. Next up was Ma Po Tofu, which we ordered to give ourselves a point of reference. The dish was so wildly different (and superior) to any we’d previously tried that it hardly accomplished that purpose. Where most versions I’d tasted relied upon chili bean paste, here it was those Sichuan peppercorns that stepped to the front. And we were still in the previews. The feature had one of the most uninspiring names imaginable: “Boiled Fish.” Yes. Boiled Fish. But what boiled fish it was! Little fillets of sweet, sweet flounder—at once fluffy and dense—floating in an angry-looking broth garnished with herbs and intimidating Japones chiles. And there, hiding beneath the surface, was a collection of faceless, anonymous and utterly delicious choys. 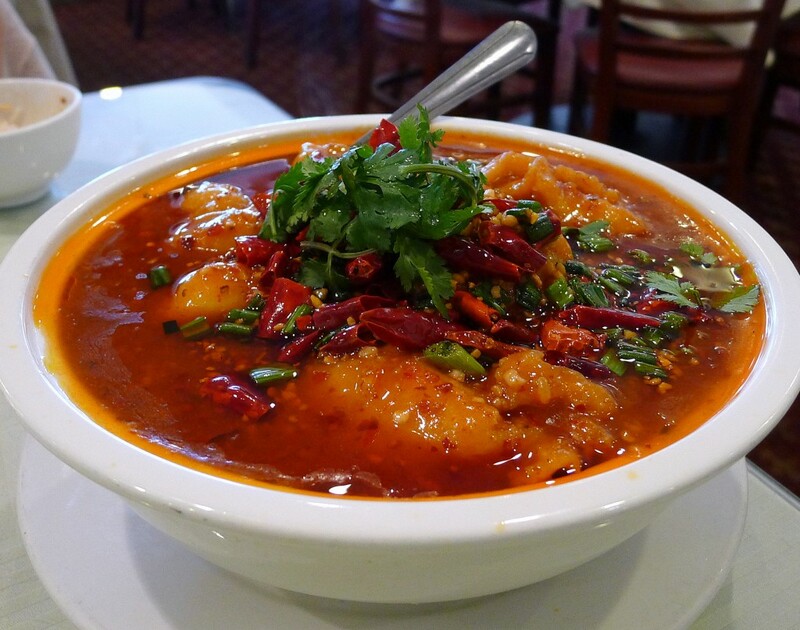 The chemical effect of the Sichuan peppercorns revealed a breadth of spicy flavors that even chili hounds might not ever know was there. The dish, as a whole, was a symphony of the loud—even though there wasn’t much talking during the meal, just mews of pleasure. What I saw, looking across the parking lot from China Max, was now readily understandable. It’s a good thing we found the place. Where last Christmas’ excellent film was somewhat spoiled by the ordinary meal afterward, following next Christmas’ movie with a trip to Spicy City will insure that the evening ends well.